Just when you were thinking about a different option of syncing and backing up your data between your iOS and other devices, BitTorrent Sync launches its application for iOS this Tuesday, initiated by the same community who gave us uTorrent (a popular torrent application). BitTorrent lets you sync unlimited files on your own devices or share with your family and friends with folder sharing option. While the data is not revealed to external servers, it satisfies the security and privacy needs of consumers. A large percentage of WordPress sites perform inadequately mainly due to the hosting issues. Cloudways, a renowned name in the Managed Hosting Industry, brings an entire Managed WordPress Cloud hosting solution for the Agencies, businesses and developers. With optimized and pre-configured WordPress platform, Cloudways offers fully managed WordPress Cloud hosting. The recent announcement by Egnyte marks the unification of its enterprise storage and sharing service with Google Drive’s document collaboration. This puts an end to the prevailing paradox about Google Drive that it’s not been built for enterprise purpose due to its not entirely secure below the file level. With this collaboration, Egnyte makes the platform of Google Drive more accessible to be used across an organization. The gaming industry has been revolutionized with the advent of the concept of cloud gaming. The concept is not really new as we all are aware of several games available on Facebook that are already running in the cloud, but the current year has been witnessing a grave interest of the traditional game companies in the cloud technology. One can play any game supporting cloud technology using any compatible device. In today’s world, we are surrounded with tremendous information;including unstructured, sensitive, valuable data and much more. Big data is evolving with advanced data analytics methodology. So what’s the concept of big data? It starts from any organizational data base to twitter retweets or Facebook posts. You just need to apply right analytics on to the various kinds of data forms in order to use it for the success of your business. This right form of data knowledge will finally result in improved business efficiency and enhanced revenue generation. IBM has bagged a 10 year deal worth $1 billion with The US Department of the Interior (DOI) to help migrating to the cloud computing model. This contract is said to be the largest US cloud computing contract won by IBM. IBM will be providing cloud services and technologies to the DOI that include data storage, web hosting, secure file transfer, virtual servers and devices, SAP application hosting and development testing. 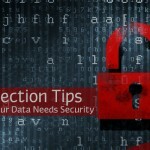 Digital Data Protection – Some Handy Tips to Strengthen Your Data Security! Windows 8 – Is It Ready for SaaS & Business? Web pages and their composition play a significant role in website performance. Recently, a report was published by Radware titled Ecommerce Page Speed & Web Performance. It included quarterly benchmark of performance and page composition of some most popular ecommerce websites. The main aim of this report was to discover the trend of changing pages over time and what kind of impact these changes have on per-page performance.